Another month another photo that has something to do with a last minute trip to Camden. Becky and myself went to little Venice after she turned up at my house 4 hours early to surprise me, what a sweetie and had the intention of getting the boat to the zoo but the lore of street food was too strong..
Boat selfie! Because, why not?! Once we finally made it to the zoo, we couldn’t go by the giant gorilla statue without trying to pose on it. While Becky managed to climb up with some grace, I as you can imagine, fell off..
ZSL has a “Meet The Monkeys” enclosure where the Squirrel Monkeys run free around you, easily one of my favourite parts of the day! On the Sunday Becky and I got the train to Liverpool for the “Girls Day Out” show, while it wasn’t quite what we expected, there was some rather yummy dancers before each fashion show which can’t be sniffed at.. I was lucky enough to go and see The Nutcracker performed by the Northern Ballet company, post on that coming soon, but I can say it was magical! To celebrate a few things at work, our team went to tour and taste at the Southwark Brewing Co. I always thought that I didn’t enjoy beer, however the tasting taught me that I just don’t like certain hops used in a lot of the more popular beers. I attempted to make hummus and I was chuffed with the results. I got a unicorn onesie ready for #BloggersInvadeCentreParcs and hanging with the #TeamUnicorn girls.. I visited Winter Wonderland with blogging friends Laura, Bec and Isabelle. I know it was a little early but it certainly got me feeling festive! While at Winter Wonderland I couldn’t resist getting this Nutella and ice cream waffle, so yum! I went to the JewelleryBox pop up shop which had a special pre opening event for bloggers. Needless to say, I spent a lot of money on gifts for my friends and for me and I can’t wait to post about them soon. The department store down the road from my office had reindeer outside, I’m still not sure why..
Talking of reindeer, how amazing is this one in Covent Garden?! The lights around the Apple Market never fail to impress. As you may have seen in my post, I wore this gorgeous Studio 75 dress to the #LadbrokesLuckOfTheIrish event which was an absolute blast, a full post on that is coming soon. They may have been tempura battered as I was too much of a wuss to try them in the traditional way but I tried oysters for the first time while I treated my parents to dinner at Loch Fyne. Delicious! 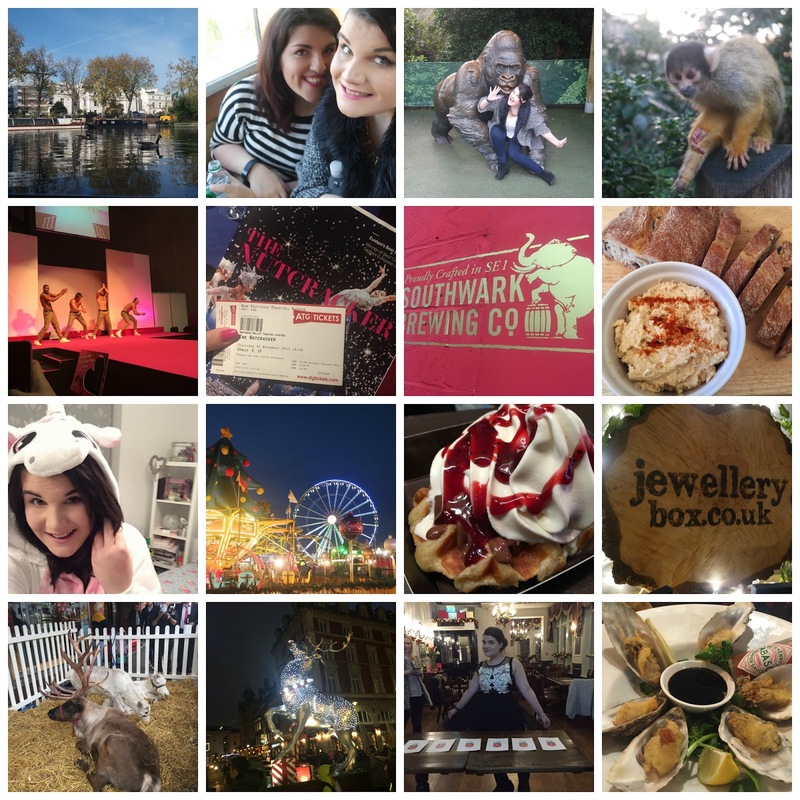 What did you get up to this November?